Axiomtek's SBC84832 3.5-inch embedded SBC uses the Intel Atom N270 processor combined with the Intel 945GSE chipset and ICH7M Southbridge, which offers power-optimized and robust performance-per-watt for cost-effective embedded solutions. The onboard 1.6GHz Intel Atom N270 processor provides outstanding performance with very low-power consumption and fanless operation. The Mobile Intel 945GSE Express chipset comes with the Generation 3.5 Intel Integrated Graphics Engine, and the Intel GMA 950, which provides enhanced graphics support over the previous generation graphics and memory controller hubs. 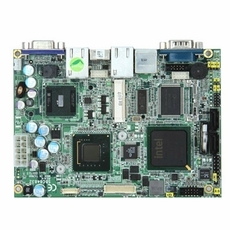 Moreover, the SBC84832 supports CRT (2048 x 1536) and LVDS LCD (1600 x 1200) dual-view displays, and delivers flexibility high-bandwidth expansion capability with one PCI Express mini card for custom system configurations. The SBC84832 is excellent solution for digital signage, kiosks, POS, thin clients, digital security, and industrial control.